I have a cold and I feel pretty ordinary. So I’m eating simple food that’s easy to prepare and easy to eat while snuggled up under a blanket. 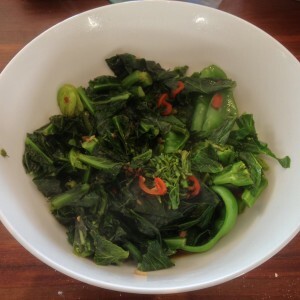 Today’s lunch is one of my go to dishes when I am not feeling well, a big bowl of stir fried greens. Today it is snow peas, plus some leaves and shoots from some bolting savoy cabbages in the garden, spiced up with garlic and chilli and soy. In Asia the greens would most likely be kangkong also known as water spinach, morning glory and a number of other names. The traditional recipe from lots of countries in south-east asia has belacan shrimp paste in it. I have a vegan belacan paste made from soy that I bought from The Cruelty Free Shop. They also have vegan fish sauce. Both of these are great for making south-east asian food taste authentic. Neither the original or vegan varieties taste fishy. But they add an important salty, fermented character that makes asian food taste, well, asian. Heat the oil in a large pan or wok. It should be hot. Add the garlic, chilli and belacan paste and stir fry quickly for about 10 seconds. Don't let the garlic burn. Add the greens, stir fry until they wilt. If the need some assistance add a few tablespoons of water, stirring all the time. Don't overcook, the greens should still be a beautiful green and have some bite. Turn off the heat and add soy and kecap manis to taste. This might seem like a lot of greens but they will wilt down. Any type of robust green is good. Kale, cabbage, water spinach, any of the asian greens like bok choi or chinese broccoli will all work. Just don't overcook them. When I have a cold I like to make a soup of couscous, stock, lemon (zest and juice), chilli and coriander. I poach thin strips of chick in mine, but you could easily sub for tofu. It takes less than 10 minutes to make and is easy to eat, even when you don’t have much of an appetite.